Let me start by saying- I am not a Stay at Home Mom. I mean, I AM. That’s what anyone would call me. But the title is so, so inaccurate. I am a take-kids-to-swim-lessons mom. I am a host-a-playdate-mom. I am a go-to-the-beach mom, a running-errands mom, a might-as-well-be-a-chauffeur-mom. I don’t go to work everyday, but I’m also not likely to be found at home, either. But sometimes? We HAVE to stay home. Because we’re potty training, or waiting on an appliance repair person, or someone is contagious (even though they feel fine). Maybe it’s too hot, or maybe there’s snow. But for whatever reason, sometimes you just have to stay home all day. And if you’re into that sort of thing? That’s likely not a problem. But if you’re not? You’re trying to fill the longest.day.ever. 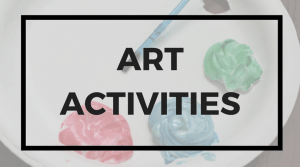 with activities for stir-crazy kids. After a recent Hand-Foot-Mouth scare over at our place, we found ourselves quarantined. No one felt particularly sick, but we’d been advised to stay away from our friends for a day or two. Lila took it hard (I might as well have handed home a death sentence), but I took it upon myself to sieze the day and make it an amazing one. An amazing day that happened to include six hours of television. But who’s counting? 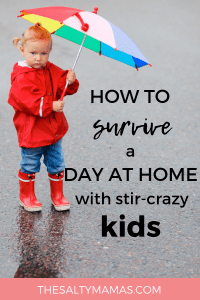 So if you find yourself in a similar position, we’ve got some super fun activities for stir-crazy kids that will make that long day at home a fun one, too. Looking to shake up your indoor activities for kids? Check out this FREE challenge with Indoor Activites for Toddlers and Preschoolers, beginning January 14th. Sign up now at Hands on as We Grow! Craft Kits- We keep several of these Alex craft kits around for just such occasions. 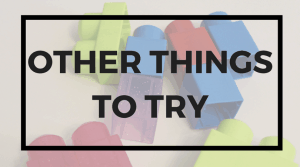 They are self-contained and a great way to keep kids busy when you don’t have time to prep. Free Painting- Bust out some watercolors, tiny pots of paint, or set up an easel, and let kids paint the day away. Salt & Glue Painting- This art project has several different stages, which makes it a GREAT time filler. You can read all the instructions here, but the gist of it is that you squeeze glue onto paper, shake salt onto the glue, and then paint the salt with watercolors. Tin Foil & Cotton Swabs- It’s as easy as it sounds- tear off a sheet of tin foil, give your kids some cotton swabs and a little pallette of paint, and let them get to creating. Get the details here. Recycled Materials Painting- Raid your stash of recyclables, like egg cartons or toilet paper rolls, and see what your kids can create with them. Here’s how we do it. 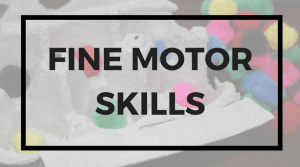 Monster Truck Painting- Take the toys to the canvas with this art activity, which combines the fun of hot wheels with the creative expression of paint. Shaving Cream Art- Another multi-stage activity. Get the full details here. Cotton Ball & Clothespin Painting- A new take on classic painting. Get the details in this post. Painting Ice Cubes- There’s something fun about the impermanence of ice. Give your kids some watercolors and brushes, and let them paint the ice cubes. The colors will mix and swirl as the ice melts, creating a changing canvas as you go. Glitter Glue or Paint- Because everything is better with a little sparkle. Wet Chalk on Black Paper- Chalk behaves differently when it’s wet. Give your kids the chance to explore what it does by soaking the chalk in a small amount of water and handing out some black construction paper. Bubble Wrap Printing- This is a process art activity with very little prep and VERY fun results. Get the project details here. Baking Soda and Vinegar Art- Fill a shallow pan or plate with baking soda. Add food coloring to vinegar, and let your kids drip vinegar onto the baking soda. It’ll bubble and change, and kids will get a kick out of their creations. Sink or Float?- Give kids a bucket of water and some items to start with, and have them test which objects will float and which will sink. Let them find their own objects to add (within reason). Hands on Letter Learning Activities- Take this stuck-inside opportunity to practice learning letters with these hands-on alphabet activities from Paper Heart Family. Low prep and easy to implement, you can get started with this well-laid-out ebook today. Measuring Tape- Show your kids how to use a measuring tape to measure…well…pretty much everything. Gardening or Planting- If you can head outside, do it! Prune back your plants, remove dead flowers, plant any seeds you may have. It’s a great way to tend your garden and take a break from being indoors. Penny Boats- In this STEM challenge, kids will try to design a boat made of a single sheet of tin foil. They’ll try to keep it afloat as they add pennies, one at a time, until they find the best boat design. Magnifying Glass Station- Place some items in a tray and give your kids a magnifying glass. Pennies, feathers, leaves, grass, books, and fruits/vegetables make excellent objects to check out on a bigger scale. Scoop & Pour Water- Head to the bathtub, or give your kids a big tub of water. Add some measuring cups and spoons, bowls, pitchers- whatever you can think of!- and let kids scoop, pour, and measure water as they transfer it from one container to another. Frozone Ice Challenge- Freezer your kids’ favorite action figures in a block of ice, and have them use the scientific method to get them out. Find our free printables and the full instructions here. 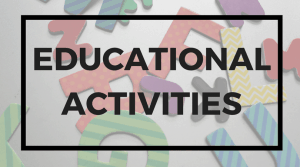 More Educational Activities- We’ve got TONS of exciting ideas in this post. Stickers- Time to break out that Dollar Store stash! Consider having your kids make cards for family or friends, or just let them freestyle. Stringing Beads- String pony beads onto pipe cleaners or yarn to make bracelets and necklaces. For an added challenge, have kids practice making patterns or sorting by color. Learn to Use with Chopsticks- Have a timed race to see who can move the most pom poms from one container to the other first using chopsticks. Or, make snacktime a little more fun by using them. (You can use regular ones or get training chopsticks here). Popcorn, with all it’s lumps and bumps, makes for excellent chopstick practice. 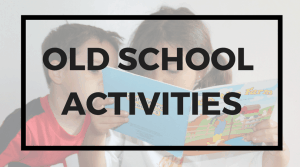 Coloring- Old-fashioned coloring books are the perfect time filler for a day at home. Consider printing up some sheets of your child’s favorite characters for added fun. Paper Tearing- Tearing paper into smaller pieces is fantastic for working on hand strength. Give your children some scrap paper- or even something like a phone book!- and let them tear it to shreds. As a bonus, they can use it to make a collage later. Dry Erase Books- These fun books allow kids to work on their alphabet skills and prewriting. If you don’t have one handy, you can place a paper into a page protector or laminate it. A picture frame will also work! We love this art prompt that lets kids create funny faces again and again. Work on School Readiness- Now’s the perfect time to work on those school readiness skills! Take a look at the list and see if there’s anything your kids still need to practice. Prep and Play with Some Busy Bags- We’ve compiled a list of our favorite busy bags for kids in this post. Get out the materials for play time, and then package them up in bags when you’re done. Two birds with one stone! Homemade Playdough- This is a two-in-one activity. First you make the playdough, and then you can actually play with it. Get our favorite recipe at this link. Fluffy Slime- Ahhh, slime. You either love it or hate it, but either way, it’s bound to keep the kids busy. And if you’ve been avoiding it for a while? It’s gonna be an extra fun time-filler. We’ve got a fun twist with our Fluffy Slime Recipe. Long Bath- Bust out the color drops, the bubble bath, or all the toys. Pretend your kids are swimming, and encourage them to stay in there FOR.EV.ER. Ice Table- Pour some ice into the water table and let kids scoop and pour with the ice. Shaving Cream Table- I mean…this is GOING THERE. But the kids will have So.Much.FUN. with a water table filled with shaving cream. And they’ll make a mess. But at least it’ll be a clean-smelling mess? 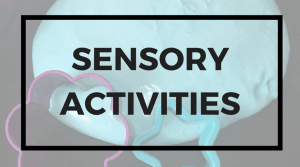 Smell Spices from the Cabinet- It’s not what you typically think of when you hear “sensory play,” but your kids can learn and experience a lot with the smells available just in your kitchen cabinet. Tea Party- Serve your lunch tea party style, complete with lemonade “tea” and sandwiches cut small. Insist that everyone hold their pinkies up while they drink, and use a fancy English accent. Bake Cookies– Or cake, or brownies. Whatever your family is into! On a recent at-home day, I found a box of cake mix in the back of the cupboard and some rogue sprinkles. We googled a frosting recipe, baked the mix into smaller cakes, and each of the kids got to decorate (and then eat!) they’re own little cake. 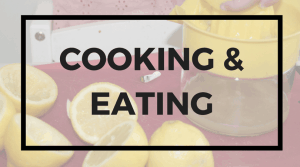 Cook Dinner Together- Get the kids involved in the chopping, stirring, and mixing. Turn dinner time into a project. Ice Cream in a Bag- You can make ice cream with simple household ingredients. Find the recipe and instructions here. Make Lemonade- It’ll take a while to squeeze all those lemons, make the simple syrup, and chill it. You can get our recipe here (and even prep for your own lemonade stand someday in the future). Puzzles- Pick a puzzle just outside of your kids’ abilities and work together to put it together. Movie with Popcorn- I know, it’s more screen time. But it’s also a little more fun if you make a production of it with blankets and pillows and legit popcorn (do you have an air popper? They’re the coolest). Build a Fort- Get fancy with some chairs and the couches, or just drape a sheet over your kitchen table. Settle inside your fort with some blocks or books, or add flashlights for extra fun. Board Games- It’s time for Candyland, Chutes and Ladders, and Sneaky Snacky Squirrel. Winner picks the next game! Do Some Chores- At least a bit of your day should probably be spent tackling your “to do” list. Hand out the towels and furniture polish, and have your kids put a little effort into keeping the house looking nice. Read a Chapter Book- If you’ve been putting off starting chapter books with your kids, it’s a great opportunity to get started. Might we recommend Harry Potter? Dance Party- If you’ve got an Alexa, have her crank up the tunes, or Google some kid classics like the “Freeze Dance” or “The Cha-Cha Slide.” Do your kids even KNOW what the Macarena is? If not, make It your mission to teach them TODAY. Finish a Project- Whether it’s one of yours or one of your kids, we’re gonna guess that there’s a project laying around your house somewhere that needs to be finished. Switch out the hallway pictures, put the final touches on that canvas you were painting, or rehang that coat hook that keeps falling down. Move and Groove Inside- We are OBSESSED with this Magic Moves wand. You can passively sit on the couch while the wand tells your kids to jump, skip, or dance around the living room. It really does add a little magic to your kids’ movement. Organize and Donate Toys- Kids can help you to go through their toys and choose some to give to others in need. Puzzles with missing pieces, anything that’s broken, or toys that haven’t been played with in months need to get kicked to the curb! Jump on an Indoor Trampoline- We have SO gotten our money’s worth out of this indoor trampoline. I’ll be honest- I don’t let it live in the house, because it takes up a bit of space. I keep it in the garage and bring it in when we need it, which makes it that much more fun. Get Out the “Complicated” Toys- You know what I’m talking about- the BIG bin of legos, or the magnatiles, or that playdough princess castle. Anything that you usually say “no” to- today, it’s your chance to say YES. 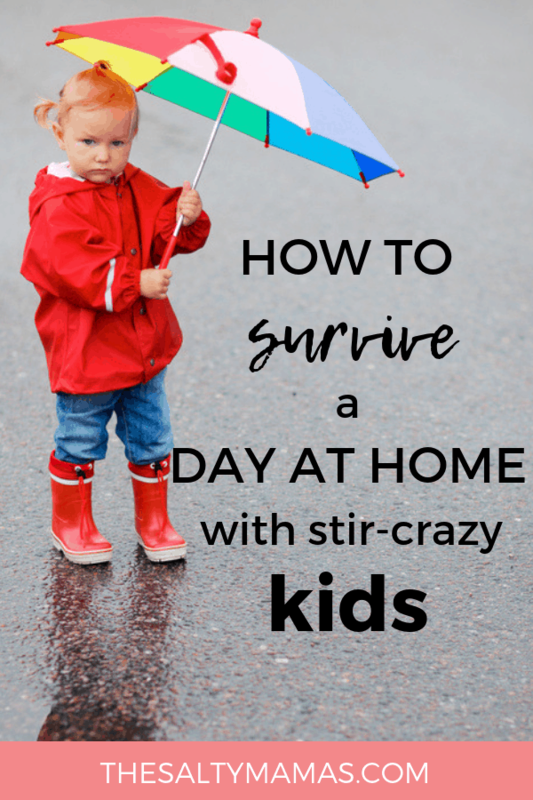 By utilizing some of these ideas, you might make it through a stuck-at-home day alive. It’ll be a close call- but mama, you’re gonna MAKE IT. What would you add to our list? Tell us in the comments below (and don’t forget to follow us on Pinterest, where we’re adding new ideas every day)! Looking for more fun ideas to help keep your kids occupied? Check out these fun posts!